NEW YORK, NY, May 18, 2016—Architects and design professionals from around the U.S. will gather May 19-21 for the 2016 AIA National Convention in Philadelphia. 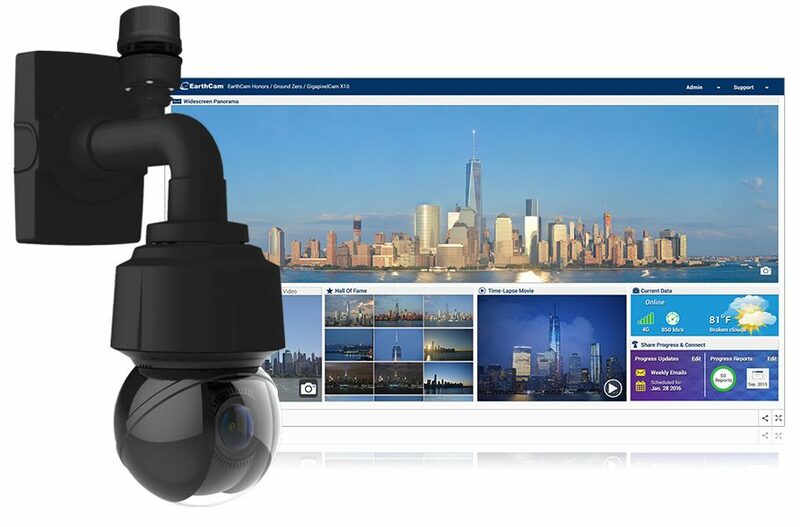 One of the largest events in the Architectural Industry, it is the perfect platform for EarthCam to present the latest in innovative webcam technology, including its new ConstructionCam 4K. The new ConstructionCam 4K delivers high-quality live streaming video for remote monitoring and 8 megapixel imagery for historic project documentation. In addition, the robotic system auto-generates impressive 500 megapixel panoramas, which lend themselves perfectly to showcasing significant projects in a dramatic way. The ConstructionCam 4K includes a built-in 4G wireless cellular modem, making installation a seamless process in any location. The unique camera is the first of its kind to feature an integrated weather station, delivering real-time detailed weather information, including actual jobsite temperature, barometric pressure, wind speed, direction, gust and severity. With useful information like this readily available, architects can protect their designs during unforeseen weather events throughout the construction process. For nearly 20 years, EarthCam has documented projects by many design firms including: AECOM; BIG-Bjarke Ingels Group; Ennead Architects; Foster + Partners; FXFOWLE; Gehry Partners, LLP; Gensler; HDR Inc.; HKS Architects; HOK; Jean Nouvel; KPF; Perkins+Will; Renzo Piano Building Workshop; Rockwell Group; Shigeru Ban; Snøhetta; SOM; Stantec; Weiss/Manfredi; Zaha Hadid Architects; as well as projects for the Architect of the Capitol. Projects this year include SANAA’s Grace Farms, Adrian D. Smith’s Jeddah Tower, Rafael Vinoly’s 432 Park Avenue and Zaha Hadid’s only residential building in New York City, 520 West 28th Street. EarthCam is currently working with Steven Davis of Davis Brody Bond and Spacesmith on the design of its own 10-acre campus in Northern New Jersey. Progress for the webcam technology leader’s new world headquarters can be seen live with EarthCam’s construction cameras at www.earthcamhq.com. Visitors to EarthCam’s Exhibit #2658 will have the opportunity to view a live demonstration of its leading-edge webcam solutions, including the GigapixelCam X10 for documenting massive projects, tall buildings and stadiums and its most basic, low cost 18 megapixel time-lapse solution, Work Zone Cam, for projects of all sizes. In addition, attendees can get a closer look at EarthCam’s recently-released new Software as a Service suite, Control Center 8. To learn more about EarthCam’s innovative webcam technology solutions, visit www.earthcam.net.